Join us for a recap of our lunch experience at Jaleo, the newest restaurant to open at Disney Springs! We would like to thank Disney for inviting us to this exclusive hosted lunch at Jaleo Disney Springs! This was a private event that was exclusive to invited guests, so all food was provided free of charge. With that being said, please know that we are always honest when we recap these events! Today we’ll primarily be focusing on the food and overall lunch experience. If you’d like to see photos of the decor and learn about the history of the restaurant, click here! Central dining room of Jaleo. Photo courtesy of ThinkFoodGroup. 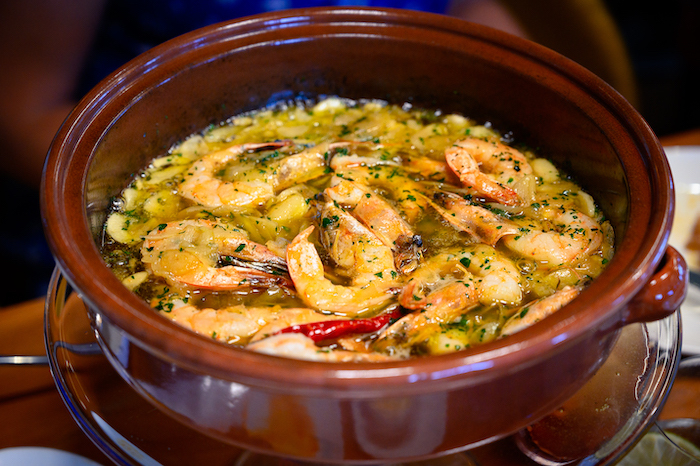 Jaleo is known for its signature paella and Spanish tapas-style dining. The menu is full of exotic and flavorful dishes that can sound a little intimidating at first. You don’t need to be an adventurous eater to find something you’ll enjoy, however if your go-to theme park meal is a cheeseburger and fries or a basket of chicken tenders then this might not be the restaurant for you. 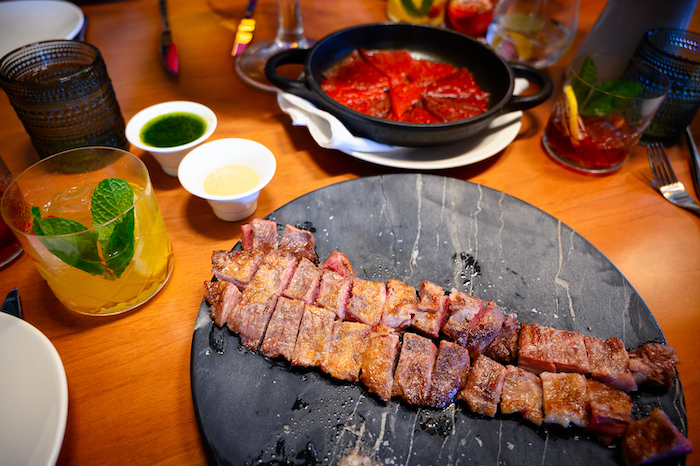 Jaleo is a place for those looking to have a full dining experience. You’ll want to set aside a decent amount of time to dine here, especially if you have a large dining party. This is a place to relax, have fun, and enjoy a nice meal with family and friends! 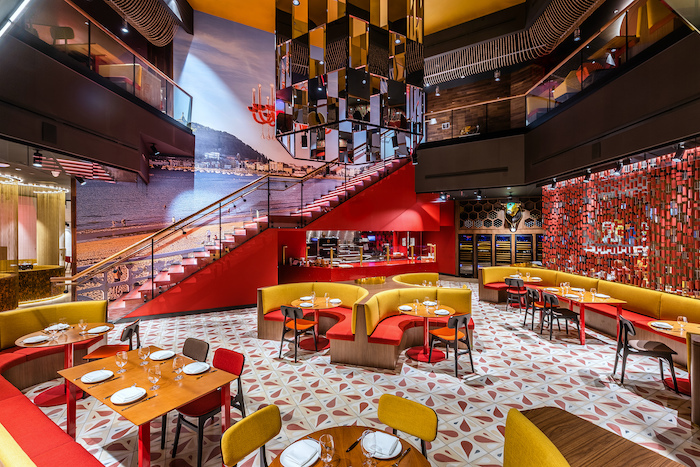 Thousands of colorful tiles can be found on the floor and also as wall accents by the bars and dining area. Photo courtesy of ThinkFoodGroup. 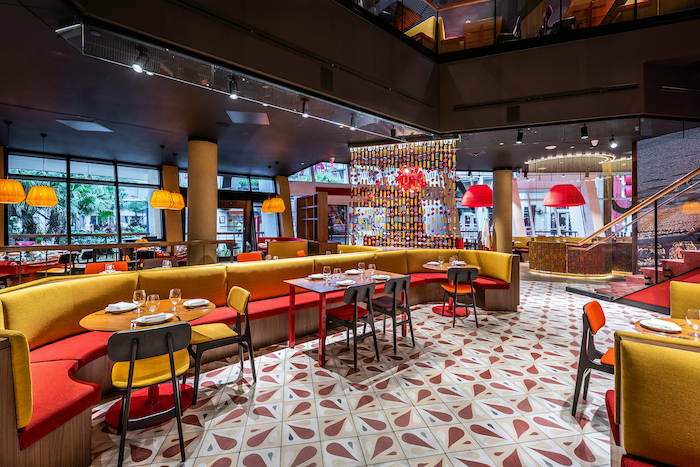 During our lunch, we were given a taste of “José’s Way,” which is a multi-course tapas dining experience curated by Chef José Andrés and his culinary team. 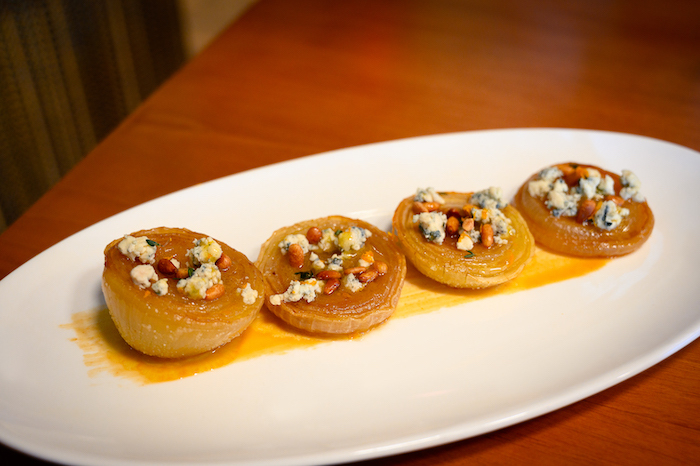 This multi-course experience is $110 per person (plus tax and gratuity). The whole experience took around three hours from start to finish, however we were taking our time to socialize and take lots and lots of photos! To start off our meal, we were given a selection José’s favorite tapas. 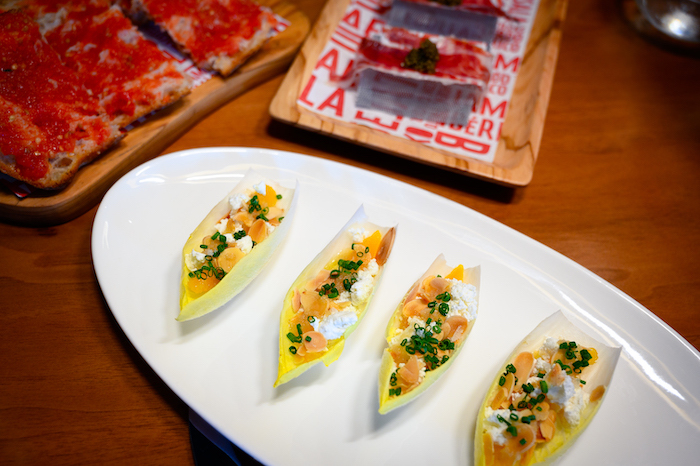 Tapas are served similarly to shared appetizers—that way each person gets to try a little of everything! Full disclosure: I wouldn’t call myself a picky eater, but there is one thing I am picky about, and that’s seafood. While I didn’t try any of the seafood during our meal, I did make sure to get lots of photos for those who might be interested. 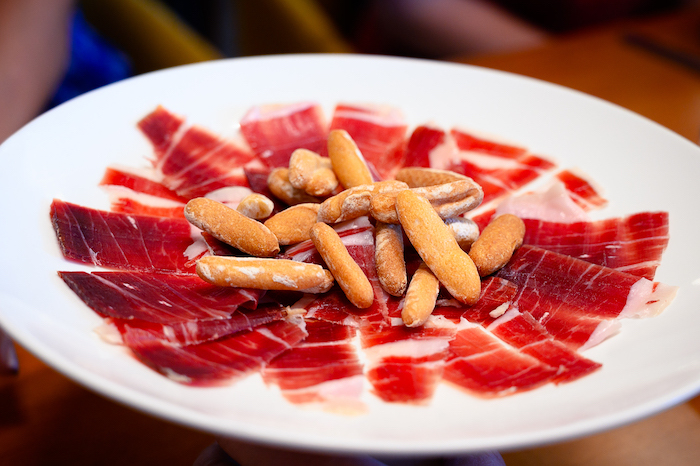 Jamón ibérico de bellota cortado a mano. Photo by Courtney Reynolds. This dish is so simple but extremely flavorful. The ham is carved table-side, which is a really nice touch. The ham has such a great texture, almost like a jerky. I could have eaten a whole plate of this myself! Aceitunas modernas y clásicas. Photo by Courtney Reynolds. This is one of the most interesting things I’ve ever tried in my life. The dish comes with two kids of olives, Classic and Modern. The Classic Olives are green olives stuffed with peppers and anchovies. I did not try those because I don’t like peppers OR anchovies. Double whammy. The Modern Olives are basically puréed green olives inside what can only be described as a giant popping boba. It literally bursts in your mouth, which might be an off-putting texture for some but I didn’t mind it. 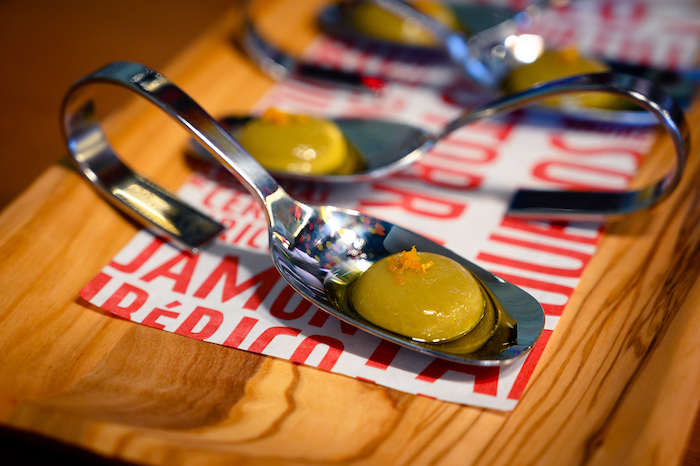 It’s very creamy and tastes just like a Spanish olive. Endivias con queso de cabra y naranjas. Photo by Courtney Reynolds. Can I tell you a secret? I have not stopped thinking about this dish since I tried it. Hands down, this is my favorite thing on Jaleo’s menu! It’s refreshing, tangy, salty, sweet, and everything in between. It’s everything I never knew I wanted in a meal and I will be dreaming about it every day until I can eat it again. Cebolla asada. Photo by Courtney Reynolds. This is also a really well-rounded dish. I’ve always been a bit afraid of blue cheese, but I gave it a try anyway. The mixture of salty and sweet surprised me! The pine nuts add a crunch that is much needed since the onions are so soft. 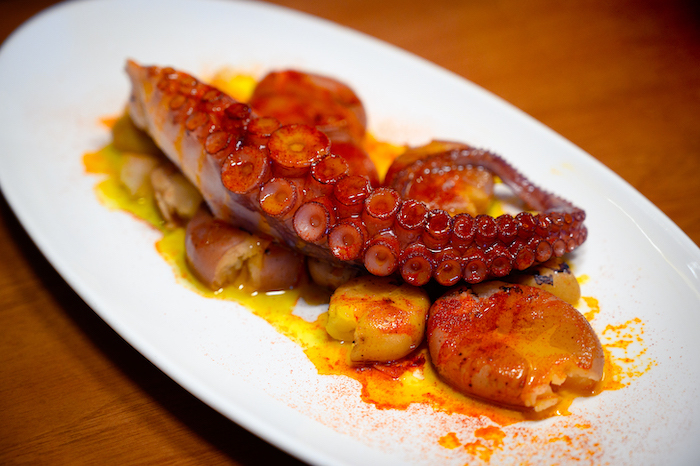 Pulpo a la Gallega. Photo by Courtney Reynolds. This exotic dish falls into the seafood category so I simply admired it from afar. Just look at the amazing texture on that octopus—a photographer’s dream! After our tapas, we were given a few larger family-style meals to enjoy. These meals are also meant to be shared and serve parties of two or more. Here’s a look at some of the large plates we tried! ‘Rossejat’. Photo by Courtney Reynolds. This is another seafood dish that I stayed away from simply because I don’t like shrimp. It looks like it would be perfect for shellfish lovers though! Secreto ibérico bellota con pan con tomate y salsa verde. Photo by Courtney Reynolds. This pork shoulder left me absolutely speechless. Pork is pretty low on my list of favorite meats. I’d pick beef or chicken over it if I had to choose. However… this pork completely changed the game. The pork by itself was outstanding but add one of the sauces and you got yourself a home run! Arroz de verduras y setas de temporada. Photo by Courtney Reynolds. Of course, it wouldn’t be a meal at Jaleo without some paella! This is what the restaurant is most known for and it’s for good reason. The restaurant has five flavors of paella on the menu. Each night only two of the five flavors will be featured so be sure to inquire with your server before you meal to see which ones will be available. Guests can purchase it by the plate or by the pan for parties of eight or more. 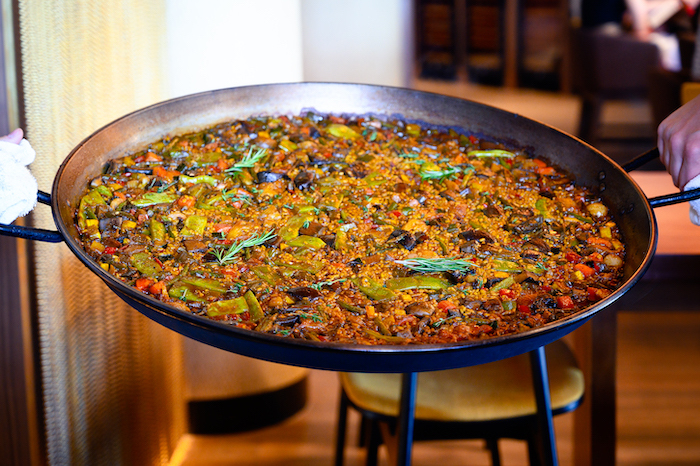 If you would like a specific paella for your visit, you can place an order 24 hours in advance. 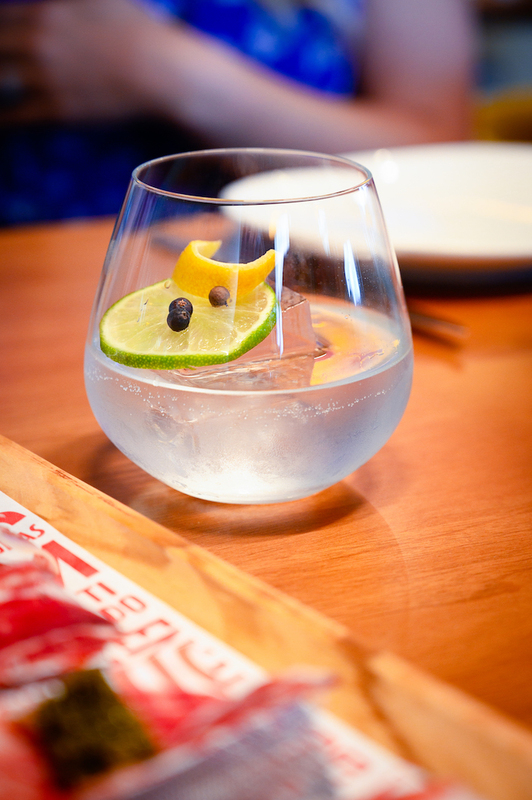 The Ultimate Gin & Tonic. Photo by Courtney Reynolds. 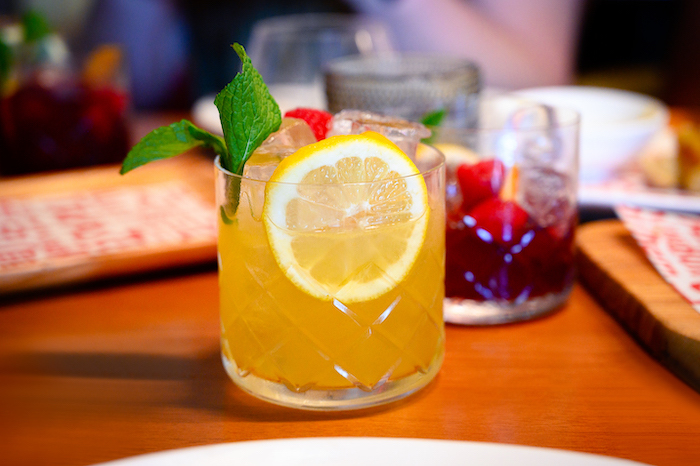 I’d be remiss if I didn’t mention the incredible drink selection at Jaleo! They have multiple bars throughout the restaurant that feature some amazing signature drinks including wine, beer, sangría, and specialty cocktails. 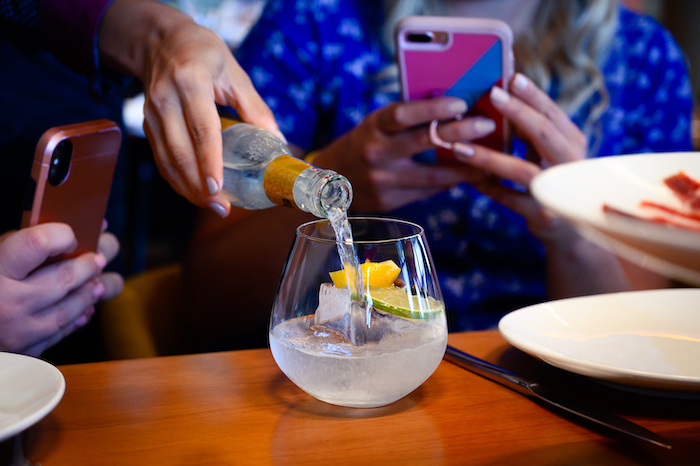 A popular drink at our table was the Ultimate Gin & Tonic. Gin and tonic is not my drink of choice so I didn’t try this one, but it sure looks pretty! The giant ice cube is truly iconic! Sangría de lujo cava. Photo by Courtney Reynolds. Sangría de lujo tinto. Photo by Courtney Reynolds. 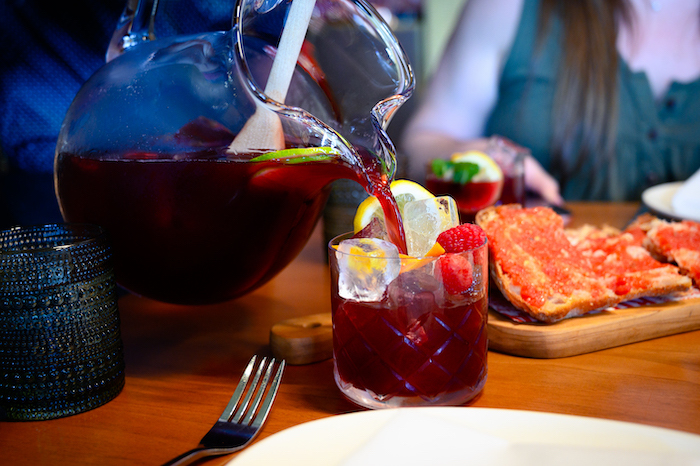 If you love sangría, you’re in the right place! Jaleo has two kinds of Spanish sangría that you can enjoy by the glass or by the pitcher. I tried both flavors and they both are fruity and refreshing. If I had to choose between the two, I’d say the red one is my favorite. And now for the grand finale: dessert! You might think that you don’t have enough room for dessert, but you are wrong. There’s always that little extra hidden pocket in your belly with just enough room for a few sweets. Here are a few notable favorites! Flan al estilo tradicional de mamá Marisa con espuma de crema catalana. Photo by Courtney Reynolds. Out of all the desserts we tried, this one is my favorite! 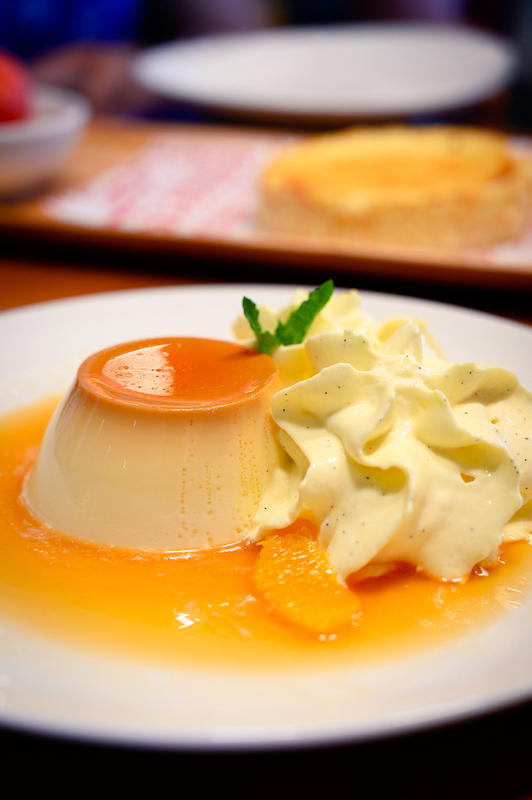 The creaminess of the flan goes perfectly with the acidity of the oranges. And that Catalan cream has a citrus flavor that is out of this world. Cítricos con helado de acite de oliva. Photo by Courtney Reynolds. Another great citrus-based dessert! This would be perfect for a hot day because it’s very light and refreshing. Quesada Asturiana. Photo by Courtney Reynolds. I have another secret to tell you… I don’t like cheesecake. Yep. You read that right. I don’t like cheesecake. 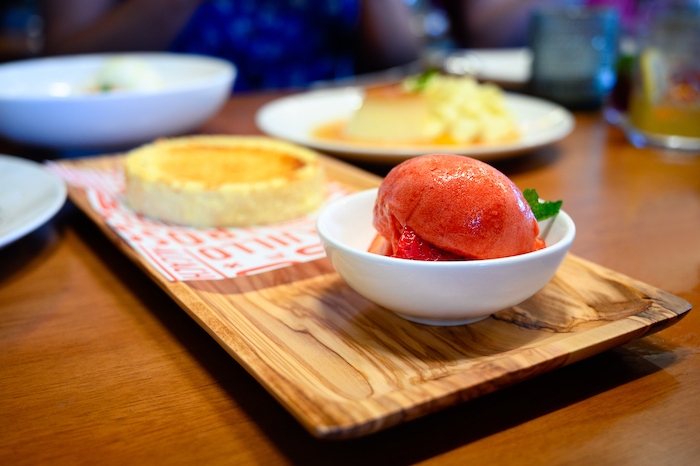 But for you cheesecake lovers out there, Jaleo has a dessert just for you! 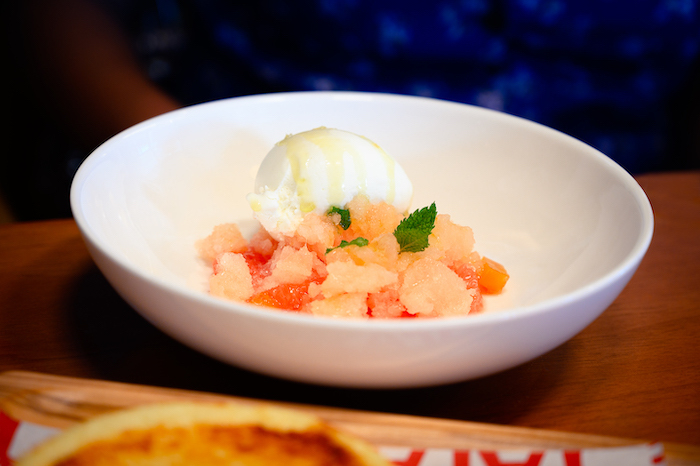 And it comes with a side of the most delicious seasonal sorbet, which I did try and highly approve of. 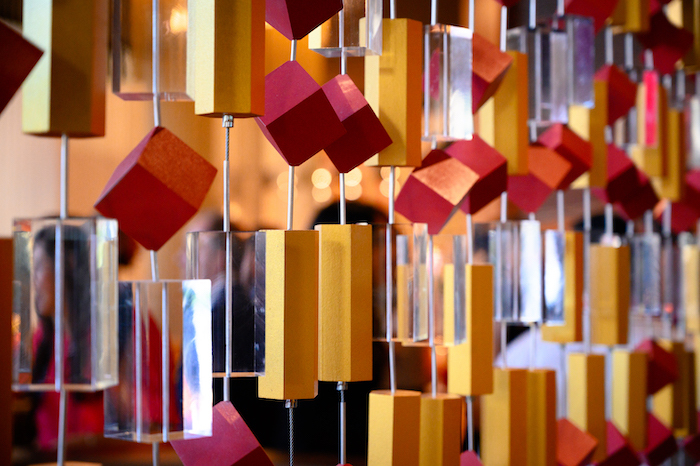 I love all the geometrically designed details. Photo by Courtney Reynolds. 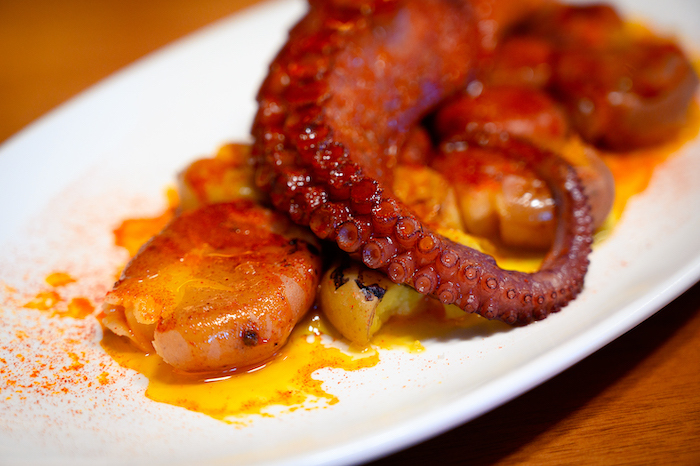 You really can’t go wrong with a meal at Jaleo! It truly is a celebration of Spanish culture and cuisine. Upon looking at the menu on my first visit, I was worried that I wouldn’t find anything that I would like—especially because a lot of the menu is written in a language I don’t speak very well. I’m here to assure you not to worry! The chefs and servers at Jaleo are extremely kind and helpful, and will be able to answer any questions you may have about the menu. I guarantee you will be surprised and will find many dishes to enjoy during your visit. Oh, and Jaleo even accepts the Disney Dining Plan! How cool is that? 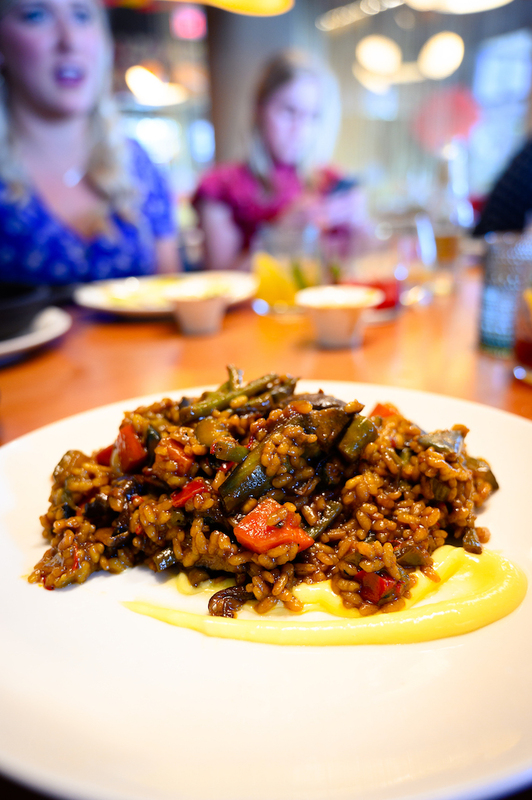 I am definitely putting Jaleo on my list of go-to restaurants at Disney Springs! Connect with Courtney on Facebookand Instagram! 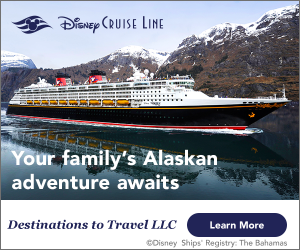 Are you a Disney foodie? Subscribe today!